Bouthaina Shaaban, political and media adviser to the Presidency of the Republic, stressed that making peace and establishing a bright future for Syria may be more difficult than winning the war, pointing out that what Syria has been subjected to over the past years was the result of a Zionist colonial plan that tried to destroy its independence and territorial sovereignty. 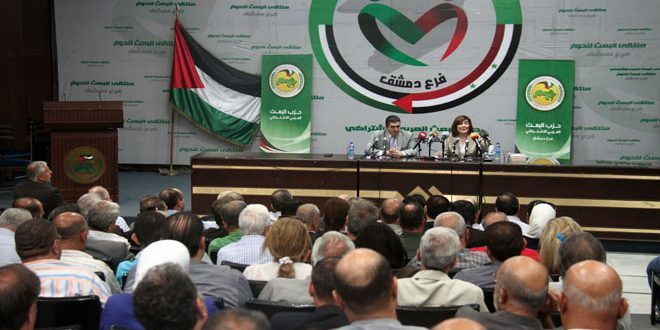 During her participation in a political dialogue with the party leaders in the Damascus Branch of the Arab Socialist Ba’th Party, Dr. Shaaban explained that the malicious media played an essential role in the war against Syria through the misguidance that instigated strife and division among the members of society. This requires awareness and rootedness in our opinions. Dr. Shaaban pointed out that Syria is allied with friendly countries that met their interests in defeating terrorism, which constitutes a danger to the whole world, indicating that this alliance with a friend believes in the sovereignty of Syria and its national decision. In response to the interventions of the participants in the dialogue session, Dr. Shaaban explained the importance of countering Takfiri thought in the next stage through the establishment of seminars and dialogue in Syria characterized by a diverse society of races and religions. The problem lies not in religiosity but in the political and criminal programs of the Muslim Brotherhood. Dr. Shaaban also stressed the need to adhere to education, values ​​and community conscience, which is dedicated to belonging to the land and the historical heritage. The meeting was attended by the Secretary and members of the leadership of the Damascus branch of the Arab Baath Socialist Party and the leaders of the people and teams in Damascus. Sanctions or an Internal Crisis? Live from Nicaragua: Uprising or Coup?